I couldn’t come any earlier so I arrived in Berlin on Friday night at about 1:00 (Saturday morning), got some hours of sleep and found my way to the Congress Center about two hours before my own talk. This allowed me to see most of “Cultivating Empathy“, an important talk that did not provide me with too much news, but I left it with the intention to read more fiction again (which I actually did since then!). The room I had my own talk “FSFE’s edu-team - past, challenges and future” had no recording equipment installed But I can tell you that I had a very interested audience and I talked to a lot of people about Free Software in education afterwards and the next day. Due to the many conversations after the talk, I missed ”FSFE Legal Team & Legal Network – Yesterday, Today and Tomorrow“. Anyway, it was a great event with lots of nice conversations. Can’t wait until the next summit! 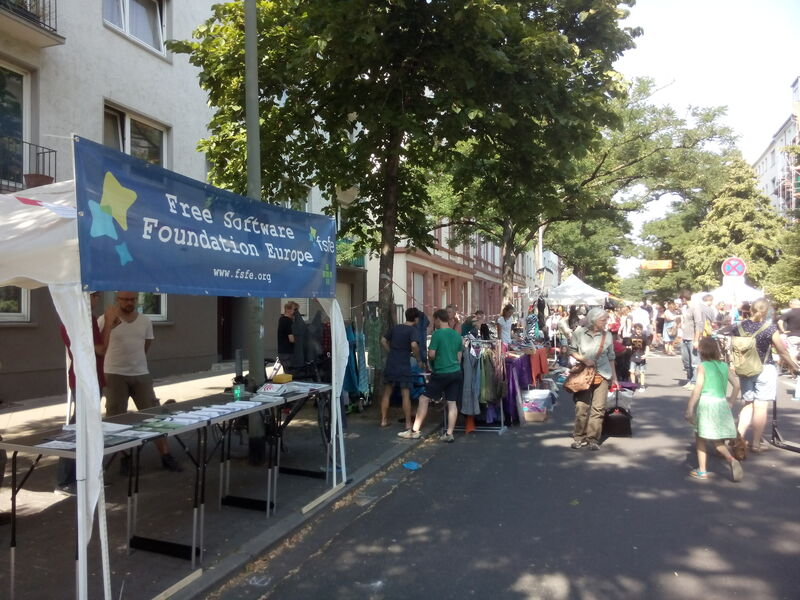 Beginning September, there was not only the first FSFE summit in Berlin: Just three days later, our group met in the “Coworking Zentrale” to update the Free Software handouts we adopted to our needs last year from the group in Munich. It was a very productive meeting and it had to be as we needed current flyers for the Rotlintstraßenfest on the upcoming Saturday. 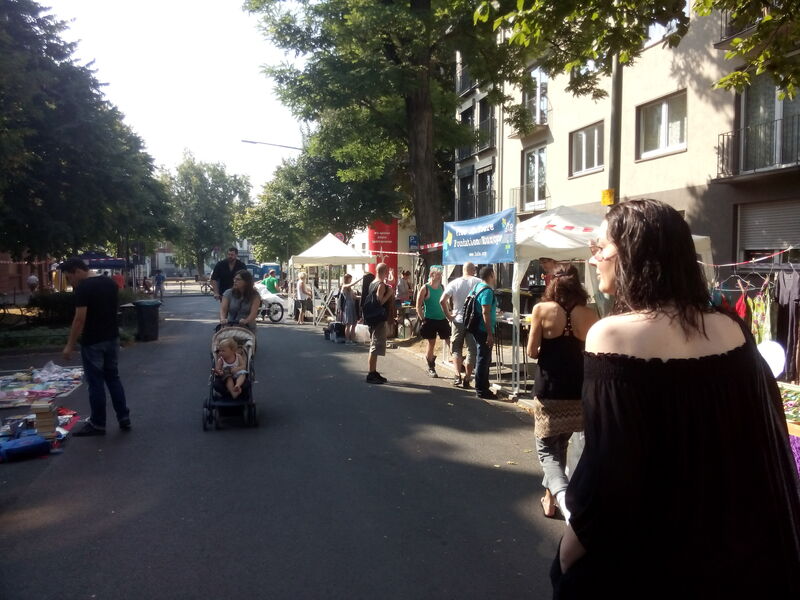 The spot we were assigned to turned out to be less fortunate as last year as we couldn’t manage to organize electrical power supply to show the FSFE15 video with subtitles in various languages in a loop and to power our outdoor Freifunk router. Well, our mission was to talk to people anyway so this wasn’t really a big deal. At first, I thought there were not as many conversations with people than last year but then I realized that we had more helpers at the booth which was the main reason why I was able to get something to eat and take short breaks which wasn’t the case last year. Thanks to all involved from working on the hand outs, providing hints and feedback until staffing the booth! It started as a busy month and it continued to be one. Hence the late and very short report of our activities. A posting about the Summit is also still in the queue… The next meeting is already around the corner (next Wednesday) in Mainz. We had a busy day - Can you spot the booth? Well, that’s it for now. See you next time in Mainz! Further details about our meetings can be found in the Wiki. For the future, I guess we have to communicate this a little better. And as some time sensitive topics were added to the agenda we couldn’t work on the flyers as much as we wanted to. The old (and tiring argument FS vs OS. I pointed to Björns article about the issue. How to tackle common preconceptions like “it can’t be as good if it doesn’t cost anything”. As a follow-up to a talk Michael Stehmann gave at an insurance company, we were asked if we could provide more workshops and talks related to Free Software as there seems some interest among the employees. As agreed on earlier, we decided not to come up with our “own” events for LPD but rather support existing events in the area. This will not only bundle the limited resources for these events but also strengthen the network of active people. There will be a “project week” in a nearby school. We may end up organizing a talk about FS and/or a cryptoparty. I’ve been invited to a workshop at the university to talk about Free Software in education and asked the participants for imput for this. We summarized the discussions of the last few weeks about the closure of the FSFE office in Düsseldorf and related topics. The trigger was a letter that a school kid brought home, informing the parents that a Windows 10 device with MS Office 2013/2016 will be made mandatory to participate in class. As outrageous this sounds for Free Software supporters, I fear that this is getting common practice throughout Europe and that most parents accept it with a shrug. I’ll be happy for any feedback dispelling or confirming this fear. Is there a template letter to complain about it? The original poster asked if there was template letter for such cases that he could use to inform the school that this practice is not what he expects from a public body. Wouldn’t it be nice to have such a template or maybe even a booklet of templates? As English is most commonly understood in Europe, it would be best to start with an English version and move on with translations into other languages. In fact, creating a section with sample letters has been on our wish list for years already! Feel free to plunge in! As the last post in the discussion so far, Max shared some brief findings from the European Free Software Policy Meeting in Brussels, that it is difficult to “convince” in a letter. It is important not to exaggerate and point out the benefits of the recipient. Advocating Free Software or demand our rights? It was discussed whether the focus of the letter should be to convince the school that Free Software is a great thing or rather that they are obliged to leave the minority the right to keep using the systems of their choice. Some may argue that the majority is using Windows anyway and simply won’t care. Does that entitle a public school to force those who do care to give up their freedom and privacy? Are we in such a weak position that we have to beg the institutions to let us use Free Software or is there any legal ground where we can claim the right to do so? Use your right to participate! Either way, we should make our voice heard more often. During the course of the discussion, Michael encouraged parents to use their right to participate in decision making processes in their kids’ schools. This process is highly regulated in Germany and what parents can actually do is limited but still, they do have a say on school matters. How is this done elsewhere in Europe? Is this practice even legal? Public schools force their students/pupils to use a certain operating system with known backdoors, with a certain office suite using a certain cloud software and various kinds of privacy issues, e.g. 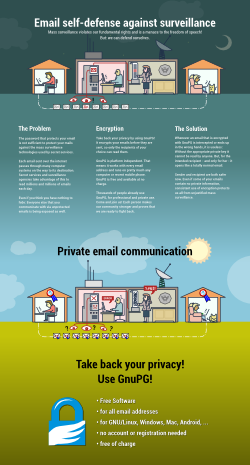 : storing personal data in a different jurisdiction. Is this practice legal? The answer seems to vary depending on which federal state in Germany you look at. How is it in your area? Do you know any rules or laws that would prohibit this kind of practice? A while back in Switzerland, an expert group recommended to use Free Software after analysing Microsoft’s offer called live@edu back then due to privacy and lock-in concerns. Data protection law would prohibit the data collection mentioned in the proposed contract. It was mentioned that a similar practice is accepted, and even the default, when it comes to school books. The schools decide what books will be used in class. Why should it be any different with Software? I am grateful to Bernd who pointed out that these analogies are missing a crucial aspect. What shoes I wear will not change the way I run and I’ll be as fast with a similar pair of shoes as with the ones I was asked to buy for class. A certain schoolbook will not change the way I read nor change my ability to read or understand complex texts in other books. Software is fundamentally different. Using a certain software program defines a certain work flow and way of thinking. Learning a certain work flow and get effective with it takes time and effort (with any software). Almost nobody has the motivation or resources to constantly change the way to get a routine task done, especially not if one is already comfortable with one. Just ask a vim user to use emacs! The program I use to do my homework will probably be the same I write my first job applications with. And the file format will most likely be the same as well as the place where I save them “in the cloud”. Forcing pupils to use proprietary software, will push them into the lock-in trap. or the widening “Rich-Poor Achievement Gap” may be another argument against such practices. What burden may it be for a poor family to purchase a computer that meets the requirements of Windows 10? They have to buy that computer. There is no way around it. So, they will have to relinquish something else like healthy food or family time as they have to spend more time at work. One thesis in the discussion was that only bad publicity will make the school at hand reconsider their practice. FSFE usually tries to follow a different approach. That doesn’t mean we’d ignore bad news and don’t deal with them. The question is: What will make people change their view? I think it is much more sustainable if the people grasp the idea and benefits of Free Software instead of just “being forced to allow it”. Geza suggested to mention the pedagogical angle as well. Free Software offers diversity, allows to experiment and try out various alternatives (different editors, programming languages, desktop environments) and thus leads to a competent self determined and responsible handling of the opportunities available. Part of the problem is that teachers usually don’t know anything else than MS products themselves as they’ve been in the same creature-of-habit cycle as they are about to push their students. Bernd pointed us to a tutorial video how OneNote can be used in class and had to admit that it looks pretty impressive and that there is probably no Free Software alternative which would allow a similar work flow. Bernd is missing an easy to use alternative. Without these alternatives, it is difficult to object (object in the sense of “successfully convince others”). To create a video that starts a thinking process has been on our ToDo list for a while. It was mentioned that with a list of programs, the same thing could be achieved, but it is highly questionable if this zoo of different applications will ever be used in class. It is clear that a lot of good stuff can be done with Free Software, but we need to show to the interested audience that it is practical as well. We need you! Do you know somebody using Free Software in class that is willing to create a presentation? Do you know presentations that have been given before and were recorded (preferably under a free licence)? 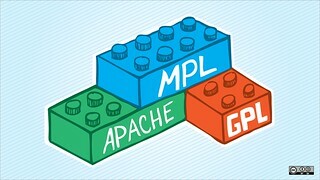 Are you aware of any educational institution that teaches on/about Free Software? Going-to-be teachers need to see what is possible with Free Software. It needs to be proven that Free Software can deliver exactly what they need. Not necessarily what they think they need. It’s not my goal to mimic OneNote or other proprietary products. At the end, the work flow in the tutorial wasn’t that smooth either. I’ll advertise this summary on the English mailing list. Please join the discussion there or drop me a note if you have anything to contribute. Thanks! I’ll present a few bullet points of my notes as a brief summary of the event until the slides will be avialable someday under the appropriate wiki entry. As we gathered together, Jenny informed us about her experiences at airports through the last year when she consequently used her right to say no to body scanners. Many just don’t know that you don’t have to go through them in Europe. Although no effort is shown to educate the passengers about this fact. Security staff rather intimidate reluctant passengers. We were lucky that Michael could combine it with another Free Software advocacy talk in the Rhine/Main area on that day. But on the other hand we didn’t have much time to promote the talk very much. Despite this and flue season we gathered eleven people who followed the talk and the discussions thereafter. I didn’t take many notes as a lot was known to me and my interest was kind of focused on liability questions for official agencies. (somebody who couldn’t attend asked that question beforehand. One argument against Free Software is that nobody can be held liable for it, but how much does it differ from proprietary software? One participant once checked on exactly that and said that the max amount e.g. Microsoft would pay is five thousand US$. Insurance policies for software liability quesions can be bought and are quite common. FLAMain purpose for new projects as permission of all contributors is hard to get after the project is already mature and “old”. There is interest in the group for an update on the current affairs in Munich/Limux. I’ll check with our fellows in Munich. There is also demand for an easy guide wich licenses are compatible and why you should take licence X rather than Y. I thought that’s already available. How about Wikipedia? Well, that’s it for now. See you next time in Darmstadt on April 6! Further details about our meetings can be found in the Wiki. My router at home has been running on it for years now and I haven’t had ANY trouble with it ever since I flashed it. (OK, I messed up the config once but I can’t blame OpenWRT for that). I used to reboot it every two weeks or so with the stock firmware. We once again met in Café Albatros in Frankfurt. A lot of people excused themselves for various reasons so we ended up with just three persons. In this small group, I participated more than I took notes, so this will be a rather short post. Main subject was the planning of our next meeting on March 2 in the Coworking Zentrale. Initially this was supposed to be our chance to still do something about the upcoming municipal elections in the federal state of Hesse. On the other hand, many of our regular visitors have expressed interest in a talk about Free Software licenses. And it happens to be that legal network member and long term FSFE activist Michael Stehmann will be in the area on the very same day our next meeting comes up.He agreed to give the talk on this occasion so this is what we are going to do at our new meeting location! Depending on how many politicians will find the time to visit us just a few days before the elections, we should still manage to combine both subjects to a certain extend. The German Army uses MS Office 365 o.O? The next date for the Rotlintstraßenfest seems to be September 10, 2016. So, you volunteers, mark your calendars! That’s basically what my sparse notes reveal. I am looking forward to the next meeting in Bornheim with the talk about Free Software licences. More details will follow soon on our group page in the Fellowship-Wiki. Zwischenzeitlich hat sich bereits geklärt, dass unser erstes Treffen in der Coworking Zentrale im März stattfinden kann. Näheres dazu in Kürze. Dieses Projekt ist ja nach ein paar zaghaften Emails, die leider unbeantwortet blieben, etwas eingeschlafen. Ich kam noch immer nicht dazu bei den bereits angeschriebenen Einrichtungen mal nachzuhaken, hoffe dass aber irgendwann mal tun zu können. Der erste Entwurf für die Anschreiben und eine Liste der Einrichtungen, die auch Öffnungszeiten haben, die für uns relevant sind gibt es im EtherPad. Wir werden uns wohl auch dieses Jahr wieder mit einem Stand auf dem Rotlintstraßenfest beteiligen. 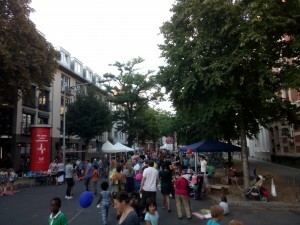 Kennt noch jemand andere Straßenfeste an denen ein solcher Stand sinnvoll wäre? Eine Möglichkeit wie wir Freie Software auf dieser Messe hätten präsentieren können wäre ein Beispiel-Rechner gewesen auf dem die Programme, die wir auf den FS-Hand-outs vorstellen installiert wären. Aufgrund der kurzen Vorbereitungszeit haben wir uns dagegen entschieden dort einen Stand anzumelden. Vielleicht werde ich es aber schaffen wenigstens am Sonntag mal dort vorbeizuschauen. Hätte sonst noch jemand Interesse? Leider habe ich mir hierzu keine Notizen gemacht. Ich kann mich nur schwach daran erinnern, dass zu dem Thema kaum etwas gesagt wurde. Wenn sich etwas in dem Bereich im Rhein/Main Gebiet ergibt, würde ich vorschlagen wir hängen uns da dran statt das Rad neu zu erfinden. Eines der angesprochenen “Arbeitstreffen” in der Zentrale wird wohl den Handouts gewidmet werden. Wir haben die ja blind von den Münchnern übernommen. Da ich einige Programme nicht kenne, würde ich mich persönlich wohler fühlen, sie wenigstens mal selbst ausprobiert zu haben. Außerdem kann man bei der Gelegenheit herausfinden, ob die URLs noch korrekt sind und ob sich nicht vielleicht bessere Alternativen finden lassen. Auch wenn wir mit der Zentrale dafür einen geeigneten Ort haben würden, denke ich passt so ein Thema eher in die Räume des CCC. Dirk hat sich bereit erklärt zu demonstrieren wie er Kalender-Einträge/Einladungen mit mutt verwaltet und ich würde die Kombination von mutt mit org-mode und notmuch zeigen. Wäre nicht schlecht, wenn sich noch jemand findet, der ein paar Mutt-Rezepte vorkochen kann. Addressverwaltung und GnuPG-Einbindung würden mir noch spontan als Themen einfallen. Auf der fsfe-de Mailingliste hatte sich Michael Stehmann angeboten einen Vortrag über Freie Software Lizenzen bei uns zu halten. Dazu besteht Interesse. Hier warten wir mal ab, da er sich möglicherweise sowieso mal in Wiesbaden aufhalten könnte. Wenn sich da näheres ergibt, werden wir berichten. Im Zusammenhang einer Diskussion auf der Free-Your-Android Mailingliste, unterhielten wir uns über mögliche WhatsApp/Signal/Telegram Alternativen. Stärken und Schwächen bestimmter XMPP Clients (Resourcen und Prioritäten, OTR und OMEMO) und irssi und bitlbee. Hierzu gab es vor Jahren auch mal ein Post von Hannes Hauswedel. Wir wollen versuchen in 2016 mal ein paar Gesandte dorthin zu schicken. Die Vorträge des 32C3 schaut man sich am besten ohne Youtube direkt vom Media Server des CCC an und am allerbesten via BitTorrent. Und das wars auch schon. Das nächste Treffen findet wieder im Café Albatros am 3. Februar 2016 statt und beginnt um 19:00 Uhr. Details dazu, wie immer im Wiki. Den Tisch werde ich wohl diese Woche buchen. Wer kommt noch? Daneben gab es die FSFE Meldung noch in anderen Medien. Die beiden Vorträge sind leider an jemanden vorrübergegangen, der unsere Treffen seit Februar nicht mehr besucht hatte. Das kommt davon, wenn man sich nicht auf die Mailingliste einschreibt oder sich sonst wie auf dem laufenden hält. Der Linux Presentation Day wird am 14. November begangen. Die LUG Hanau macht was und was ich am Treffen noch nicht wusste: Frankfurt auch! Streit um Sprache: GNU/Linux, GenderInnen, etc. Sprache schafft Realitäten. Aber ist ein Kreuzzug um die richtigen Begriffe hilfreich die eigentliche Nachricht an die Leute zu bringen? Thomas beteiligte sich an einer Freifunkinstallation in einer Flüchtlingsunterkunft während wir sprachen und war damit entschuldigt. Björn hatte sich darum gekümmert, dass der vergangene Landesparteitag der Grünen mit Freifunk ausgestattet wurde. Das Digitalforum Gallus im März zu dem Björn eingeladen hatte, soll dort auch erste Früchte getragen haben. Es gab ein Update der XMPP Software auf fsfe.org. Danach gab es Probleme mit den Konferenzräumen, die aber mittlerweile behoben scheinen. Hat noch jemand Probleme? Wie schon öfters erwähnt, ich persönlich finde das Albatros sehr sympatisch und ich hatte in kleiner Runde nichts auszusetzen. Jedoch ist ein gemeinsames Gespräch aller nicht mehr möglich sobald ein zweiter Tisch angeschoben werden muss. Die Coworking Zentrale hat sich auf Twitter mal angeboten uns aufzunehmen. Getränke gibt es dort auch. Daneben Beamer und WLAN. Was haltet ihr davon? Ansonsten sind wir ja auch schon zwei mal ins Lilium ausgewichen. Apropos Coworking-Zentrale. Dort haben ja auch immer die Cryptoparties stattgefunden. Besteht da Interesse diese wiederzubeleben? Das Oktober-Treffen war nicht so beworben und erinnert worden wie sonst, weil mir schon wieder der RSPI abgeraucht ist auf dem die Skripte laufen. So langsam wird mir das zu zeitaufwändig. Ich denke ich werde auf einen ordentlichen Server umziehen. Kartir hat von Proton Mail erzählt. Ich habe jetzt nur kurz drüber geschaut und es sieht wirklich interessant aus. Dass die Mails und Keys nicht von den Mitarbeitern eingesehen werden können, ist allerdings ohne die Möglichkeit den im Moment laufenden Quellcode zu inspizieren nur ein Versprechen, dass man glauben muss. Nach der Einschulung meiner Tochter komme ich so langsam in die heiße Phase dieses Problem “als Betroffener” anzugehen. Thomas bot an mir zur Seite zu stehen. Bildungs-Team Mitglied Sebasstian Seitz hat vor kurzem ein Buch über Freie Software an Schulen herausgegeben. Ein Autor empfiehlt zum Dokumentenaustausch RTF. RTF ist allerdings proprietär und erlaubt auch nur rudimentäre Formatierung. Ich überlege ob MarkDown nicht besser geeignet wäre. Ob MD auf Akzemptanz stoßen würde, wird allerdings daran hängen wie komfortabel es sich nutzen lässt. Gibt es Editoren, die WYSIWYG für Markdown anbieten? Daneben frage ich mich ob Hybrid PDFs nicht das Problem lösen könnten. Daneben redeten wir darüber wie Konzerne wie Microsoft und Google keine Mühen scheuen MS565 und GoogleDocs in die Bildungsinstitutionen zu tragen. Bei einem Vortrag von Sam Tuke erfuhr ich, dass die Cloud-Lösung von LibreOffice durchaus konkurenzfähig sein kann. Rechtliches zu den SW Flyern – Impressumspflicht. Haftung bei links? Wir fragten uns ob wir ohne ausdrücklichen Disclaimer für gegebenfalls geänderte Inhalte hinter den verwendeten Links auf unseren Freie Software Handouts dafür verantwortlich sind oder ob sich die Impressumspflicht auf Druckmedien von der im Internet unterscheidet. Dieses Thema durfte natürlich auch nicht fehlen. Siehe dazu auch die Diskussion auf der Mailingliste (ff) und hier besonders den Blog Post von Daniel Pocock. 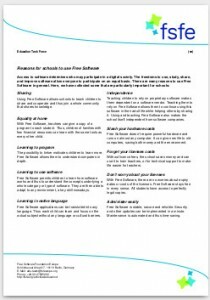 It started with a wiki page and the goal to create a short and concise list of reasons why schools should use Free Software. 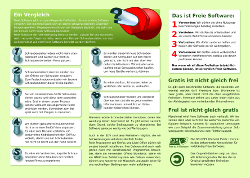 After some forging, we turned the content into an official FSFE leaflet that has been translated and is now available in nine l a n g u a g e s.
There was also a time where we created different versions of it aimed at different target groups like students and parents. Leaflets for other stakeholders were planned as well. These leaflets are available as online and PDF versions for anyone to print out and use. The PDFs are generated by a script out of the xml files and parsed through LaTeX which makes it fairly easy to maintain these many translations and versions. However, as we notice that our printed leaflets like the tools (PDF 10.5MB) or GnuPG (PDF 7.2MB) flyers are very well perceived, it’s been decided that an education flyer should be added to the list of things anyone can order from FSFE to spread the word. How should this leaflet look like? For sure we’ll include our list of arguments we have already available in 9 languages. What else would be needed to convince people that Free Software is a good thing to teach? What image or graphics should be on the front to catch attention? If you have any ideas or suggestions, please drop a note to the edu-team!